President arrives from Equatorial Guinea. .... Ghana Negotiated For Eq. 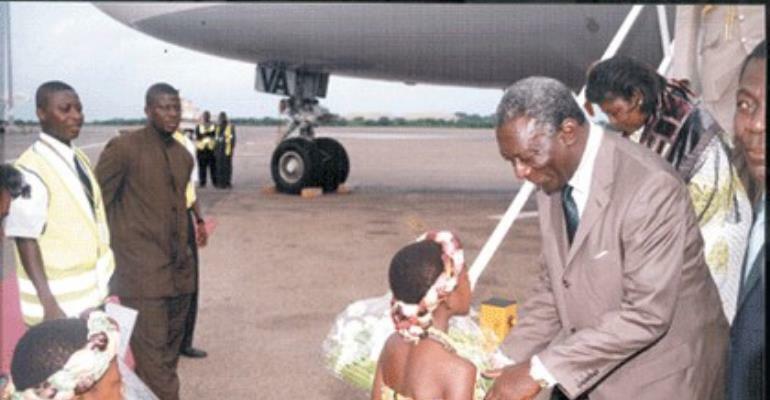 Guienea Crude Oil Accra May 31, GNA - President John Agyekum Kufuor returned home from Malabo, Equatorial Guinea on Monday after a three-day official visit to that country. Dr Paa Kwesi Nduom, Minister of Energy, Officials of the Foreign Ministry as well as Mr Kwabena Agyapong, Presidential Spokesperson, accompanied him. Briefing Journalists on the highlights of the visit, Dr Ndoum said the Permanent Joint Ghana-Equatorial Guinea Commission was to be revitalized and was expected to meet in July to bring on stream conclusions arrived at during a meeting between the Presidents of the two countries. He said Equatorial Guinea had agreed to provide Ghana with 30,000 barrels of crude oil a day at a concessionary rate. "Fifteen thousand barrels would be given to Tema Oil Refinery, while the other would be received by the Volta River Authority for the Aboadze Thermal Plant." He said Equatorial Guinea also requested from Ghana skilled personnel in the food and agricultural sectors, education, health as well as energy to which Ghana agreed. He said details would be ironed out during the July meeting, adding that the President of Equatorial Guinea would soon visit the country. At the airport to meet the Mr Kufuor, were Vice President Alhaji Aliu Mahama, Nana Addo Dankwa Akuffo-Addo, Minister of Foreign Affairs, Lieutenant General Seth Obeng, Chief of Defence Staff and Ibrahim Omar, Dean of the Diplomatic Corp.